This AmazonBasics product of the micro-cut type of paper shredder has the capacity to micro-cut 8 sheets of paper at a time. It can also cut down paper clips and staple wires still attached to papers. It can destroy credit cards, CDs, and DVDs one at a time. It comes with a regular bin of pull-out style and bin capacity of 3.2 gallons. Its continuous run time is 2 mins while its cool down time is a short 15 mins. It has dimensions of 7.8 x 12. X 16.5 inches and weighs 14.7 pounds. 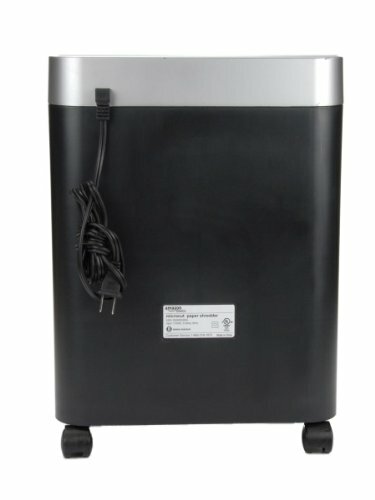 This AmazonBasics shredder has an industry standard 1 year limited warranty. There can be no doubt about it. Micro-cut paper shredders are hands down the best choice for ensuring utmost security. This model cuts pieces into tiny confetti rendering it impossible for anyone to reconstruct the pieces together again. For some, it appears to be almost as tiny as grains of rice. It is capable of turning a regular sized bond paper into 2,235 pieces of stripped papers with measurements of 5/32 x 15/32 inches or 4 x 12 mm. When you shred the same piece of paper using a cross-cut paper shredder, you can only turn 360 pieces of strips. That’s a huge significant difference between the reliable and popular cross-cut shredder and the most trusted most secure micro-cut paper shredders. If you want to make the right choice in protecting yours and your family’s security, you cannot possibly make the wrong choice with this one. Looking at the fine confetti-like shredded strips will only give you confidence that you made the right decision. You can conveniently destroy confidential data you intend to keep away from prying eyes. This micro-cut paper shredder is able to shred 8 pieces of regular paper at a time. As expected, it will slow down once you feed more than its 8 paper capacity. If you want the shredder to work at a faster rate, then you can feed only 4 to 5 sheets of paper every few minutes. It can cut just as promised. The fact that this is a micro-cut type of paper only makes it feel like hitting a jackpot. I have tried testing its capacity and found that it can surpass its own performance. I shredded 20-30 mins keeping it at a 4 pages minimum while keeping it well-lubricated. Otherwise it may only overheat. This micro-cut shredder has the Auto mode option. This Auto mode option enables the machine to automatically start shredding once the sensor detects a material that can be shredded. In cases of paper jams, you can just easily settle the jam by manual reverse. The machine will also automatically shut down once it exceeds its maximum running time of 2 mins and starts overheating. This enables the shredder to self-protect its motor. The cooling down period may take up to 40 mins. This high-security micro-cut shredder is best for busy office and small workplaces. Unlike the usual places where you’ll find the feeding mechanism at the side of the shredder body, this model’s feeder is positioned at the top. There’s still a divided opinion on this one. But personally, I prefer this new position of the paper slot. It’s more practical and more convenient this way. I can just throw in the pieces of paper on the paper slot and the shredder will do the rest. I don’t even have to align the papers. The feeder will just pull it into its side and shreds successfully. But this is better when you’re not shredding only one pieces of paper at a time. If that’s the case, you can just fold the paper to make it sturdier. The pull-out bin is an easy favorite among its users. It has a large capacity of up to 3 gallons of waste material before it needs to be emptied out. It also takes away the hassle of having to take the entire shredder head off just to empty the waste basket. This time, users need only pull out the drawer in order to get the waste basket. This is such an improvement, making things easier and more practical. Additionally, you can even insert a trash plastic bag in the drawer to enable the shredded papers to just drop into. I’ve heard a lot of talk about how getting a micro-cut shredder is too expensive and unnecessary. But I think this model gives great value for your money. It’s foolproof, it’s secure, and it’s able to perform well. The amount I paid for this machine does not even come close to the security and performance I get from it. This micro-cut shredder allows me to cut a lot more than my previous strip-cut shredders ever allowed me to.